French officials investigating the deadly Paris attacks on 13 November have identified most of the people they believe to have carried out the assaults, claimed by the Islamic State (IS) group. The attacks are suspected to have been masterminded by Abdelhamid Abaaoud, a Belgian national killed in a police raid in Saint-Denis, northern Paris, a few days later. Another key figure - Salah Abdeslam - was arrested on 18 March after going on the run. Mohamed Abrini, another suspect believed to have links to the Paris attack, was arrested in Brussels on 8 April. This is what we know about the suspects, and what the authorities have accused them of doing. The 26-year-old French national, who was born in Brussels, was wounded and arrested during a police raid in the Molenbeek area of the city on 18 March. Police had been hunting him since the 13 November attacks, warning members of the public not to approach him. On 15 March, Abdeslam's fingerprints were found in a flat in the southern Brussels district of Forest. Belgian prosecutors told the BBC at the time that it was not clear when he had been there, because the fingerprints could not be dated. On 10 December police found one of his fingerprints, traces of TATP (acetone peroxide) explosives and three handmade belts - apparently for explosives - in an apartment in the city's Schaerbeek district. The apartment had been rented in a false name. It is thought that the Belgians among the suicide attackers picked up their belts there before going to Paris. Salah Abdeslam is thought to have returned immediately after the attacks. He is believed to have rented a VW Polo car in Belgium, which was later found near the Bataclan concert hall where 89 people were killed. But he also rented a Renault Clio and reserved two hotel rooms outside Paris before the attacks. His precise role in the attacks themselves is unclear, although his brother Brahim blew himself up. Investigators believe Salah Abdeslam may have driven the three bombers who attacked the Stade de France to their destination and may have been given the job of an attack a short distance south, in the 18th district. That attack never happened. Hours after the 13 November attacks, Salah Abdeslam was in a VW Golf with two other men near the Belgian border when they were stopped at least once by police. They were allowed to drive on after checks. It is unclear whether French authorities had matched Abdeslam's name to the car found at the Bataclan by the time he was stopped. As the search for Salah Abdeslam intensified in Belgium, Brussels went into lockdown and his brother, Mohamed, appealed for him to give himself up. Salah Abdeslam's past is littered with convictions for petty crime. Belgian prosecutors said they had questioned him and his brother Brahim earlier in 2015. Some reports have said he spent time in prison for robbery where he met suspected ringleader Abdelhamid Abaaoud. He had earlier been sacked as a technician on the Brussels tram system, for missing work. Dutch police said they had detained Salah Abdeslam briefly in February, fining him €70 (£49) for possession of cannabis. On 27 April 2016, he was extradited to France, where he faces charges in connection with the Paris attacks - participation in terrorist murder and the activities of a terrorist organisation. He has also been charged in Belgium over a shoot-out in Brussels on 15 March 2016, in which four police were wounded. Salah Abdeslam's brother died after he set off his explosives-laden suicide belt near a Paris cafe on Boulevard Voltaire, investigators say. The 31-year-old had rented a Seat car which was found the day after the attacks at Montreuil, to the east of Paris. He had earlier appeared in several Belgian police files alongside Abdelhamid Abaaoud. The documents relate to criminal cases in 2010 and 2011. "Investigators see a link with Verviers," Belgium's De Standaard newspaper reported, referring to a Belgian town where police shot dead two militants in January and broke up a cell aiming to kill Belgian police officers, days after the Charlie Hebdo attacks in Paris. Earlier in 2015, Brahim Abdeslam had travelled to Turkey, intending to go on to Syria, but Turkish authorities deported him back to Brussels, Belgian judicial officials told Le Soir newspaper. The report said he had been questioned on his return to Belgium and then released. 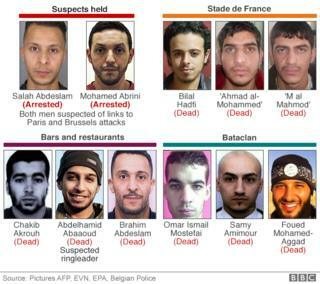 Both Brahim Abdeslam and Abaaoud lived in Molenbeek, a rundown district of Brussels with a substantial Muslim population, which is described by some Belgian officials as a "breeding ground for jihadists". Friends and neighbours who spoke to the BBC's Newsnight team said that in October 2014, Brahim Abdeslam saved five children from a burning building. "I'm grateful to Brahim for saving my children, but I can't understand what he did in Paris," the children's father said. Brahim owned a bar in Molenbeek which some reports say was managed by his brother Salah. People who knew them there have said both men drank alcohol and smoked drugs. "We're still in shock," said Youssef, a local man. "They were friends of ours, big smokers, big drinkers, but not radicals." "On Fridays, they would stay smoking on the terrace. I never saw them at the mosque," said Karim, 27, who lives in a flat above the bar. Another man, Jamal, said: "Their lives were the same as all young people: they liked football, going clubbing, coming back with girls." A police report obtained by AFP suggests the bar was shut down in early November because police believed customers were smoking marijuana there. Abaaoud, 28, is described as the suspected ringleader in the Paris attacks. He died in a long gun battle with police, who raided a flat in Saint-Denis on 18 November. Investigators believe he was involved in the bar and restaurant killings. His fingerprints were found on a Kalashnikov left in the Seat car abandoned in Montreuil. He grew up in the Brussels district of Molenbeek and was an associate of Salah Abdeslam. Implicated in four out of six foiled attacks this year, he was believed to have joined militant group IS in 2013. Belgian police believe he had been in Athens, directing a militant cell in Verviers in eastern Belgium when it was raided by security forces in mid-January 2015. Although Greek authorities were following him, he managed to evade a police raid, a BBC investigation has found. He had also been in contact with Mehdi Nemmouche, accused of shooting dead four people at the Jewish Museum in Brussels in May 2014. Abaaoud's father had become aware in the past month of his son's links to terrorism and believed he had become a psychopath, according to lawyer Nathalie Gallant. Chakib Akrouh blew himself up using a suicide vest during the police raid on the flat in Saint-Denis. He is thought to have been the third man involved in the bar and restaurant attacks that left 39 people dead as his DNA was found in the Seat car in which the three killers were driven. Akrouh, 25, was born and raised in Belgium, of Belgian-Moroccan descent. He travelled to Syria in 2013 and was given a five-year jail sentence in absentia while he was there. He was killed in the Saint-Denis explosion and it took police eight weeks to identify his remains, by matching his mother's DNA. The 29-year-old French national of Algerian descent blew himself up after the massacre at the Bataclan, eight days before his 30th birthday. He was identified from a fingertip, found in the concert hall where 89 people were killed. Born in the poor Paris suburb of Courcouronnes, he was known to police as a petty criminal - getting eight convictions between 2004 and 2010 but spending no time in jail. Between 2005 and 2012, he lived in Chartres, near Paris, where he reportedly worked as a baker and played football with fellow employees. He attended a mosque with his father. A local Islamic association leader said he showed no signs of being an extremist. Other residents said the family was "very nice". In 2010, however, he was identified by the French authorities as a suspected Islamic radical and his details were entered in a database. Since then Omar Mostefai appears to have been able to travel to Syria; he may have also spent time in Algeria. A senior Turkish official confirmed to the BBC that Omar Mostefai entered Turkey in 2013 and there was no record of him leaving the country. The official - who spoke on the condition of anonymity - said that in October 2014 Turkey had received an information request regarding four terror suspects from the French authorities. During the official investigation, he said, Turkish authorities identified a fifth individual - Mostefai - and notified their French counterparts twice, in December 2014 and June 2015. "We have, however, not heard back from France on the matter," the official said. He added that it was only after the Paris attacks that the Turkish authorities received an information request about Omar Ismail Mostefai from France. The 28-year-old was another of the suicide bombers who blew himself up at the Bataclan. The Frenchman, who lived in the north-eastern Paris suburb of Drancy, had been known to French intelligence services. He was charged with terror offences in 2012 over claims he had planned to go to Yemen. He was placed under judicial supervision but then dropped off the radar, prompting the authorities to issue an international arrest warrant. In 2014, Le Monde newspaper published an account of the journey (in French) of a 67-year-old Parisian man to Syria, in the hope of persuading his son to leave IS and return to France. Pseudonyms were used in the article but it has since been updated to reveal that the son in question was Amimour. His son refused to leave and the father returned home without him. French media have pointed out that evidently he was able to slip back into France prior to the attacks, despite the arrest warrant. Three of Amimour's relatives were reportedly arrested after Friday's attacks. It took more than three weeks for French authorities to identify the third Bataclan bomber. DNA from Foued Mohamed-Aggad's Moroccan-born mother in Strasbourg was used to confirm his role in the concert hall massacre. The 23-year-old was initially lured to Syria by one of France's most infamous jihadist recruiters Mourad Fares, French media report. He went with his older brother Karim at the end of 2013 and eight other young men from the Meinau district of Strasbourg. But seven of the group returned from Syria within months when two of them were killed. Only Foued Mohamed-Aggad remained, until he eventually came home to take part in the Paris attacks. This man was the first of three to blow himself up at Stade de France stadium. At the scene a Syrian passport was found which bore this name, suggesting the man was a 25-year-old from the Syrian city of Idlib, but authorities believe this passport was a fake. A report in a Serbian newspaper, Blic, said a passport bearing the same name and data - but a different image - had been found on another migrant, suggesting both men bought fake documents from the same counterfeiter. The Paris prosecutor's office said fingerprints from the dead attacker matched those of a person who came to Europe with migrants via the Greek island of Leros. The man may have been posing as a Syrian refugee. Records from Leros suggested he arrived on 3 October and was fingerprinted and photographed. An official there remembers the man arriving, and told the BBC's Gabriel Gatehouse that something did not feel right about him - he kept himself to himself. He said he would have highlighted his concerns to an intelligence officer, had one been there. Leros authorities say they simply do not have the resources to screen all the migrants effectively - or even check whether passports are genuine. The 20-year-old has been named as one of the attackers who died at Stade de France. He had tried to get into the stadium while France were playing Germany but was denied entry and blew himself up in the nearby rue de la Cokerie. The French national had been living at Neder-over-Hembeek in Belgium. Belgian media say he was radicalised early in 2014. Belgian prosecutors have said they were aware he had gone to fight with IS in Syria but did not know he had returned. The picture of the third suicide bomber at the Stade de France has been issued by French police. He has been named by the BBC as M al-Mahmod. He blew himself up in front of one of the entrances to the stadium, in rue Rimet. He entered the Greek island of Leros on 3 October, travelling with Ahmad al-Mohammed. French police have not yet named him, but the BBC's Ed Thomas matched the image released by the authorities with a photo on arrival papers at Leros. Our correspondent says the two men bought ferry tickets to leave Leros to continue their journey through Europe with Syrian refugees. Hasna Aitboulahcen, a cousin of Abdelhamid Abaaoud, died with him in the gun battle at the Saint-Denis flat. The daughter of Moroccan immigrants, Aitboulahcen was tracked by police who tapped her phone after 13 November, and she was seen leading Abaaoud into the flat hours before the police raid. Read more: Who was Hasna Aitboulahcen? She had become radicalised only in recent months and was thought to have had a brief conversation with police before she died. A policeman shouted out "Where is your boyfriend?" to which she responded, "He's not my boyfriend". Initial reports indicated she had blown herself up, but police later said it was a man that had done so. He has not been identified but there are some suggestions that he may have taken part in the attacks on bars and restaurants in the 10th and 11th districts of Paris with Abaaoud and Brahim Abdeslam. Jawad Bendaoud, 29, was arrested during the Saint-Denis raid and is said to have rented the flat to Abaaoud and Hasna Aitboulahcen. He told French media before he was questioned by police that a friend had asked him to look after "two mates who were coming from Belgium". "I said there was no mattress but they told me it's not a big deal. They just wanted water and to pray," he said. A girlfriend, Hayet, who was with Jawad Bendaoud on the night of the 13 November attacks told French TV that he suddenly realised he was in trouble. What happened in the days before the raid is unclear but she believes her friend had seen the state of the flat and was "aware of what was going on". Mr Bendaoud has been in trouble with the police before and has served time in prison. Mohammed Amri, 27, and Hamza Attouh, who is 21, were arrested in Belgium and admitted picking up Salah Abdeslam in France and driving him back to Brussels immediately after the attacks. In the early hours of 14 November the pair received a phone call from Salah Abdeslam, who said his car had broken down. They insisted no mention was made of the attacks carried out in Paris a few hours earlier, although Hamza Attouh said he was wearing thick clothing and may have been preparing to blow himself up. They gave conflicting versions of where in Brussels they had dropped him off. Abraimi Lazez, 39, was arrested in the Belgian town of Laeken, in a car where two guns and traces of blood were found. He is also suspected of helping Salah Abdeslam flee France. A French national, named by police as Ali O, has been accused by Belgian authorities of taking part in the actions of a terrorist group and a terrorist attack. Police believe he may also have driven Salah at one point. Two days before the 13 November attacks took place, Salah was spotted in the Renault Clio used to drop off the Stade de France attackers with another suspect. Belgian police arrested Mohamed Abrini, 29, after the 22 March 2016 Brussels attacks. Belgian prosecutors say he admitted being "the man in the hat" seen with the bombers who attacked the airport. He was already wanted in connection with the Paris attacks after being spotted in a car with Salah Abdeslam when it stopped at a petrol station in Ressons, on the motorway to Paris. Meanwhile Ahmad Dahmani, a 26-year-old Belgian, is being held in Turkey, after flying to the resort of Antalya. He is suspected of involvement in preparations for the Paris attacks. Police in Morocco detained another Belgian in January. Gelel Attar is said to have lived in Molenbeek and had direct links with Abdelhamid Abaaoud and Chakib Akrouh. He was reported to have travelled to Syria with Akrouh in January 2013.